Canyon Pass is a subdivision in Northwest Tucson. This Custom home community is built in a canyon of the Tortolita Mountains. A staffed gate at the entrance makes this a very private. The setting has dramatic elevation changes that create stunning views of the valley and Catalina Mountains. A key decision when planning to build in Canyon Pass is selecting the lot. Dove mountain is a few miles west of Oro Valley. 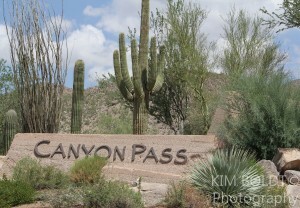 Entered Canyon Pass off Dove Mountain Boulevard north of Tangerine Road. Most lots are one acre or more and provide ample space for a luxury home, expanded patio, and pool. This Dove Mountain community offers luxury living at its finest. The gated community large lots and stunning views. Homes in this Tucson subdivision overlook the Gallery Golf Courses and stunning Catalina Mountain views. There are other luxury subdivisions near Canyon Pass and close to the Gallery Golf Club that include Dos Lagos Homes, Los Solana Homes – View Luxury Dove Mountain Subdivisions near The Gallery Golf Club – and the active adult community of Heritage Highlands. The Ritz Carlton resort is also near by and provides a challenging Jack Nicholas Signature golf course. The golf course offers memberships. Great dining and a world class spa are also found at the Ritz. The Residences at the Ritz Carlton is a gated community of custom homes. Reviewing Tucson home sales OR searching real estate Tucson for Sale? We Can Help! Questions about the Tucson Real Estate Market or Canyon Pass Homes for Sale? C all Us 866 316 5575 OR complete the CONTACT FORM and we will get right back to you!